Mother's Day wouldn't be complete without a sweet treat. You can use any doughnut or brioche dough recipe you feel most comfortable with (or store-bought!) and elevate it with these gourmet artisan fillings. These are excellent served with morning coffee, saved for dessert, or any time in between! Stir the marionberry and water together to thin the mixture slightly. Transfer it into a piping bag fitted with a wide, round piping tip. Fill the doughnuts with 2-3 tablespoons of the marionberry mixture. Set aside, and fill the remaining doughnuts. Combine the confectioner's sugar and water in a mixing bowl. Spoon 1-2 tablespoons of the mixture over each doughnut, coating the top evenly, and allowing some to drip down the sides. Sprinkle the lemon sugar over the top of the doughnuts, and enjoy. In a mixing bowl, fold the mascarpone and honey together until combined. Transfer the mixture into a piping bag fitted with a wide, round piping tip. Fill the doughnuts with 2-3 tablespoons of the mascarpone-honey mixture. Set aside, and fill the remaining doughnuts. For the topping, stir the cinnamon and sugar together in a small mixing bowl. Brush each doughnut with a touch of the tangerine honey, then dust the tops with the cinnamon-sugar. Repeat for the remaining doughnuts, and enjoy. To prepare the custard filling, scald the milk by gently heating it until just below a boil in a medium saucepan. Meanwhile, whisk the sugar, flour, salt, and eggs together in a mixing bowl. Once the milk has scalded, remove it from the heat. While whisking, slowly add the milk to the egg mixture. Whisk until all of the mixture is combined, then transfer the mixture back to the sauce pan. Over medium heat, stir the custard mixture until it just begins to thicken, 4-5 minutes. The final consistency should be similar to pudding. Remove from the heat, and set aside to cool completely. Pulverize the chocolate cookies together with the spice blend in a food processor, then set aside. Transfer the mixture into a piping bag fitted with a wide, round piping tip. 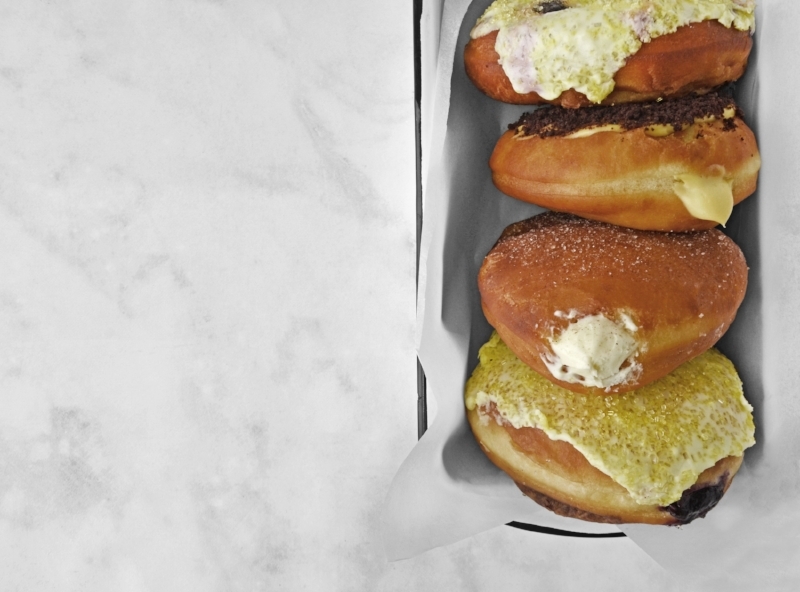 Pipe each doughnut with 2-3 tablespoons of the custard mixture, and set aside. Top each doughnut with a thin layer of the custard filling, then sprinkle liberally with the pulverized chocolate cookies and spice mixture. Enjoy.